In the near-future Tris grew up in, Chicago is a walled city. Within it, teens are assigned to a faction based on their personalities. Tris demonstrated the rare ability to think like multiple factions at once, meaning that she is a "Divergent" with the ability to choose how to live. To her family's surprise she chooses the Dauntless faction, and barely survives its bone-breaking initiation and training. After another faction uses mind control to make the Dauntless into slave-soldiers, only Tris and the few other Divergents are able to break free and stop the mind control. 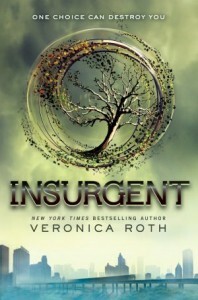 Insurgent takes place immediately after [b:Divergent|13335037|Divergent (Divergent, #1)|Veronica Roth|http://d202m5krfqbpi5.cloudfront.net/books/1328559506s/13335037.jpg|13155899], and Roth throws you right into the action. There's no summary, no quick reminder of who is who--it's just straight into Tris and friends trying to get allies against the Erudite and their Dauntless soldiers. It took me a few chapters to remember who each of the characters were, and even longer to decipher the tangled relationship webs. The plot is equally confused and confusing--Tris and her allies switch allegiances and goals nearly every chapter. But all of that could have been forgiven if only this was a smarter book. The first book focused first on the selfless Abnegation faction, then on the brave, fierce adrenaline-junkies of Dauntless. In this book Roth spends more time with the Erudite, and wow, she is terrible at writing smart characters. They outright recite dictionary definitions at each other. This, apparently, is the pinnacle of intellectual achievement. What's really sad is that the smartest Erudite of them all is actually possibly the most foolish--to protect her inner sanctum and most secret information, she sets up a security system that can identify and drug any intruder instantly. So when Tris blindly stumbles into this, she is immediately captured or killed, right? Nope. The security system identifies Tris, names her as "Divergent" (which means she can break out of mind control simulations at will), and then puts her into a mind control simulation. Which Tris is of course able to triumphantly break out of. Surprise! Not that any one else in this book has better reasoning skills: Four/Tobias surrenders to Johanna for torture, drug testing and eventual death so he can find out where central control is located. He is able to get this information back to the rebels only because Peter unexpectedly turns traitor and helps him escape. He couldn't have counted on that, so how on earth did he think this plan was going to work? Or, another instance: Tris and her crew want to prevent Tobias from killing Johanna before she gives up certain information. Instead of just going with Tobias into Erudite, so they have all of his resources and are in position to stop him at the precise moment he needs to be stopped, they get several members of their party killed while storming Erudite headquarters and arrive too late to stop Tobias. Or something else that blew my mind: Dauntless train with weapons from an early age, sleep with them, and are basically paranoid soldiers. They form an uneasy alliance with the factionless near the end of the book, although (like most factions) they've spent their lives despising the factionless. Together they storm Erudite headquarters. As soon as they've secured the Erudite leaders, the factionless ask for their weapons. Apparently suspecting nothing, and apparently willing to give up their weapons IN ENEMY TERRITORY (even though just a few chapters ago they wouldn't give up their weapons even when it was a requirement of receiving sanctuary from certain death), all of the Dauntless completely disarm and hand the factionless all their weapons. The factionless immediately proclaim themselves the new rulers; the Dauntless are super! shocked! at this betrayal. For goodness' sake! And then, the idiot cherry on the blockhead sundae, the reason everyone is living in a walled-in Chicago is revealed. Generations ago, people were upset at all the cruelty in the world, so volunteers erased their minds and entered Chicago as part of an experiment. The hope was that someday, Divergent people would be born, and this would be the end of all suffering and war in the world. lol, what? The flimsy worldbuilding, blocky writing (The word window was repeated FOUR TIMES in a single sentence. Come on.) and just plain stupid plots have overpowered this series. Tris is still a badass, but the story is just too silly and nonsensical for me to care about any longer.